How Often Should Dogs Take Baths? Nobody likes a stinky pooch, but how often should your really bathe your dog? The truth is, it depends. Some dogs rarely need baths, while others need frequent tub time. Here are some pointers to help you figure out where your dog falls in the bath scale. The ASPCA recommends that, as a general rule of thumb, dogs should be bathed every three months. Of course, dogs with different fur types require different levels of grooming. Dogs with a double coat, like huskies and shepherds, only need around three baths per year. On the hand, silky-coated dogs need to be bathed monthly. Your dog’s habits can have a big influence over bathing. If your dog has a tendency to get into sticky, stinky or food-related messes, you are going to have to bathe her more often. 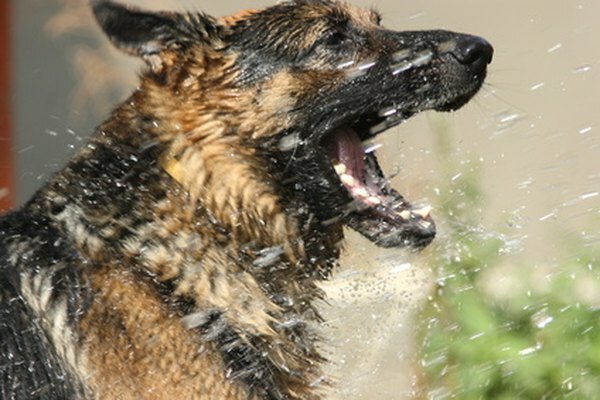 Unfortunately, frequent bathing can irritate a dog’s skin. To counteract the effects of frequent bathing, talk to your vet about choosing a gentle shampoo that won’t over-dry your dog’s skin. Frequent brushing between baths can help keep your dog’s fur clean. Brushing can remove dirt, debris and lose hair that might aggravate you and your dog. The ASPCA suggests you brush a wire-haired dog once a week, a fluffy dog a few times a week and a silky-haired dog daily. If your dog still smells after you have bathed it, there might be another cause. Try sniffing your dog’s ears and mouth to locate the smell. If either of these areas is abnormally stinky, you should take your dog to the vet. Foul breath or smelly ears could have underlying causes, like infections. Your vet can check for problems and help you treat the stink. How Often Should Parakeets Get a Bath? How Often Should You Wash a Dog?